If what you are looking for is not listed above, please give us a call and if we cannot help you we will point you in the direction of somebody who can. Appointments are not always necessary and a first interview of 30 minutes is always free of charge. Our clients have access to technology to allow them to view their files online so that they are always up to date with what is happening on their file. 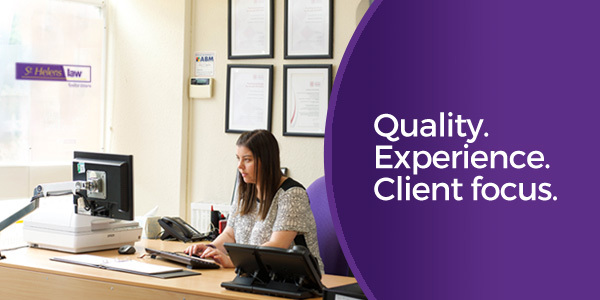 Our staff are highly trained and whatever your legal requirement, we can offer a suitably qualified person to deal with it. One of our solicitors has recently qualified as a Solicitor Advocate so we can assist you if you require legal representation in a Civil or Family Court. Not able to attend our office? It is possible to communicate by e-mail and by telephone if that is more convenient. You will be given a direct contact number and direct e-mail address of the person who is handling your matter together with a unique reference and password to enable you to check your file online using FileView. Details of the legal services we offer can be found on the tabs at the top of this page, together with information about the people who will be helping you to get the result you want. We look forward to working with you to a speedy resolution, and welcome any comments you may have to info@sthelenslaw.co.uk.